The Putnam City Optimist Club was started for one reason, to share the joy of sports with the children of the local community. Throughout the years, many children have enjoyed the programs and all of its many benefits. 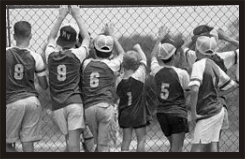 Each year Putnam City Optimist accommodates approximately 5000 youths in Football, Softball and Baseball. Baseball is played in the Dolese Park at 4600 N.W. 50th, Softball and Football are played at 8601 N. W. 50th. Alcohol, drugs and tobacco are not allowed on these properties. PCO has gained the reputation for providing a good safe place to play. We work to fulfill our civic duty to the community and our moral duty to the youth who participate in our programs.